Yep - George's catchphrase has staged a glorious return. But the UK's recovery is still fragile, and the autumn statement threatened to get ahead of itself. It’s been a long time since we last heard George Osborne’s favourite catchphrase about ‘fixing the roof while the sun is shining’ – mainly because, economically speaking, it’s been pouring with rain. 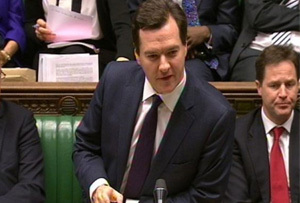 During this morning’s autumn statement, though, the chancellor used it not once, but twice. Admittedly, after all the criticism he’s endured over the past few years, it must have felt pretty sweet to stand up and say that ‘Britain’s economic plan is working’. And you could detect the pleasure in Osborne’s voice when he unveiled the fact that, by 2018/19, the UK will be running a ‘small surplus’ (although, as shadow chancellor Ed Balls pointed out later, he had originally promised to wipe out Britain’s debt by 2015). Likewise, by 2019 private sector businesses will be creating 3.1 million more jobs, which ‘more than offsets’ the number of public sector jobs the government cut. Two fingers up to the naysayers who said the private sector wouldn’t be able to cope. There wasn’t much in there that hadn’t been trailed before: alongside that surplus announcement, business rates, which Osborne said would be capped at 2% from next April, was one of the headlines we heard whispers of yesterday. Osborne added that businesses will be now allowed to pay their rates in 12 monthly installments (rather than quarterly), and he announced a ‘reoccupation relief’ for new occupiers of shops. On top of that, all retail premises with a rateable value of less than £50,000 will get a £1,000 discount on their business rates. That counts as an early Christmas present for the owners of small shops. He also announced changes to capital gains tax which means foreign investors will have to pay between 18% and 28% on residential property they sell in the UK - a sort of oligarch's bedroom tax, if you will. For the developers behind the thousands of shiny new flats being built in the capital (which they’re hoping to flog to Asian investors), that’s frightening stuff. There was also the soft stuff: using £100m of Libor fines to help charities supporting servicemen and the emergency services, an extension of the film tax relief, reforms to encourage John Lewis-style partnerships, tax reliefs on social enterprises. When Ed Balls stood up, ruddy-faced, to have his rant, his trump card was that the economy might be recovering on paper, but it isn’t filtering down to ordinary people. Figures by the Office for Budget Responsibility, published to coincide with the statement, are a case in point. ‘We do not expect real take-home consumption wages to reach their pre-crisis peak until late 2015’, says the small print. And there’s evidence that the uplift in consumer spending which is funding the recovery Osborne is all puffed up about is coming out of people’s savings. Not exactly a textbook recovery. Sadly, the jeering over Balls’ speech was too much to hear much more of what he said. Clearly, the coalition thinks it has its mojo back. The chancellor’s message might have been that we’re bouncing back – but the UK’s recovery is still fragile. Not many giveaways there (he'll presumably save that until the year before the election), but Osborne is certainly on the front foot again. Nonetheless, it’s going to be another year of watching and waiting, and hoping nothing dodgy happens in the eurozone. You’re close, George, but no cigar quite yet.